As 2016 ends, I wanted to wish everyone a very happy and healthy 2017 and hope for better things to come. I know that many people are feeling down since this year took so many notable people in the public eye, especially grouped towards the end of the year. As for myself, it’s been a stressful year due to the loss of my dad this past summer, a move to another home in the same town this past fall, along with all the usual daily stressors of running my own business and being a parent. I am looking forward to have the door hit 2016 on the way out. With the New Year comes resolutions, which, if we’re being honest, I’m not big into since they usually are broken weeks, if not days after making them. Of course I would love to stick to the more common resolutions of losing weight, eating healthier or getting more organized, but whom am I kidding. My actual 2017 New Years resolution is completely realistic, in the works and has to do with changes on this particular website. I hope to be able to debut it soon, so keep an eye out for changes here. I’m excited about it and look forward to new, creative opportunities. With that in mind and since the holiday season is just about behind us, it’s time for a new free printable. So what’s up next? Valentine’s Day, of course. I don’t do cutesy kid-appropriate Valentine’s cards with clever sayings. Instead I’m offering up something a bit more “design-y”, that makes use of graphic backgrounds, icons and typography. 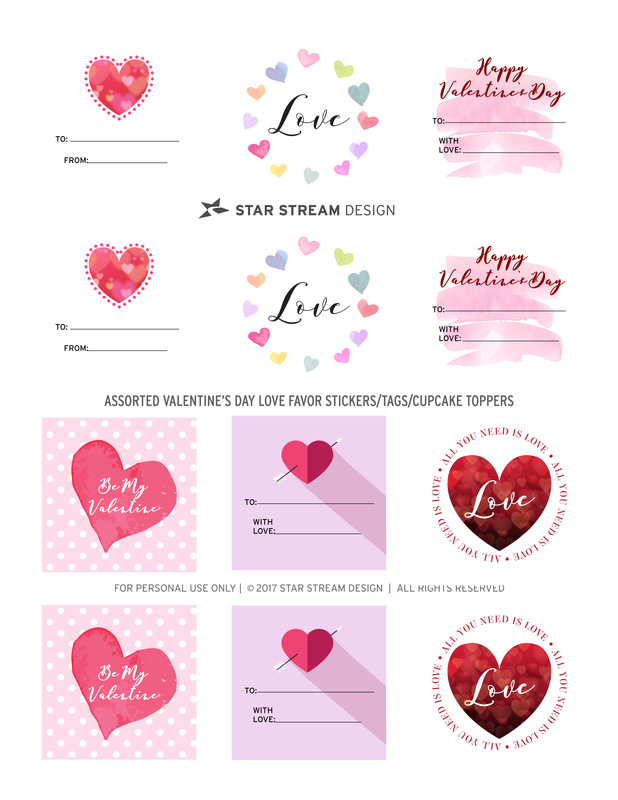 These Valentine’s Day/heart images can be used as stickers, cupcake toppers or gift tags. 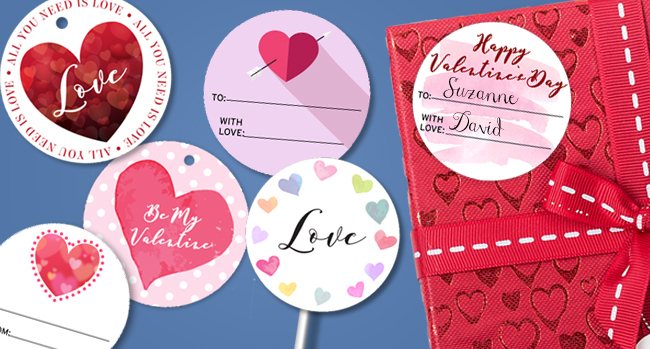 They celebrate love, not only on Valentine’s Day, but are versatile enough that you can use them year round. As always, drop me a line to let me know what you think, how you used them or share a photo.